What exactly is the Golden LEAF Foundation’s role in increasing economic opportunity in North Carolina? The Foundation was established to be an endowment for the future of rural North Carolina. Because the state was the largest tobacco producer in the nation, the then-attorney general, who went on to become governor, advocated that the court settlement for North Carolina should include using a portion of the proceeds from the class action lawsuit to help the rural counties that were negatively impacted by the decline in tobacco production transition to new economic opportunities. So, Golden LEAF was created to assist with rural economic transformation by investing in the physical infrastructure and human talent needed by rural communities to replace the revenue lost and attract new economic opportunities so that people could choose to remain in rural communities that represented prosperous places to live, work, and play. Can you give one shining example of what Golden LEAF Foundation is doing in conjunction with the STEM East network to impact rural education? Regarding ACT® WorkKeys® and the National Career Readiness Certificate®, how important is it that Pitsco’s curriculum is aligned with these standardized tests? I think talent development strategies like this are very important because we are battling both a skills and interest gap. Employers indicate they can teach new hires the technical skills, but they find it difficult to also teach them employability or life skills. They constantly seek candidates who are coachable and can work in teams to collaboratively solve problems. Do they know what to do when they don’t know what to do? Can they identify and filter through gobs of data to get to relevant information that’s necessary to solve a problem? Those traits are hard to develop and take a longer-term perspective, so having a workforce curriculum that aligns to and promotes both technical and employability skills is important. Why is it important to intentionally build career exposure and experience into the school day at all grade levels? It’s unfortunate that a lot of STEM curricula get bucketed into CTE, which traditionally is isolated from core academic courses that students take. I think having curricula aligned to career readiness helps connect career and technical education to core curricula in math, science, English, language arts, and social studies. Taking a more integrated approach that shows students, for example, how technical report writing or math gets applied in a career or a business sector is critically important. Math and science teachers, like all teachers, have so much on their plate, making it hard for them to gain a deep understanding of how the core content they teach is applied in the real-world such as in aviation, manufacturing, welding, or nursing. Having the Pitsco curriculum align to core subjects through pacing guides has proven effective in assisting students to learn how math is a critical skill that is relevant in an occupational career – we’ve seen that happen with Pitsco. Have you visited any of the Pitsco STEM/STREAM labs? I’ve been to a significant number of schools that uses the Pitsco program. I drive about 40,000 miles a year around the state, so a lot of the work that I do is going out to visit grantees and learn what’s happening on the ground. Golden LEAF sees itself as a partner to its grantees, often pushing them to go beyond what they initially proposed and grow their work with intentionality. I don’t have all the answers but do know another grantee that’s gone through something similar and found a strategy that worked. Do you recall what your initial takeaways were in those Pitsco labs? My initial takeaways came from seeing students engaged, on task, and self-directed. They had essentially taken ownership of the learning process where the teacher was serving in more of a facilitator role, coaching students to help them explore, discover, and think more deeply about the problems they were trying to solve. That was a very important observation. I saw a level of excitement from students who may not see school as their thing but through hands-on learning see the relevance of what they are learning in core subjects and how that knowledge can be applied to a work-related experience. Why is Golden LEAF focused primarily on STEM education for Grades 4-9? In our infancy, Golden LEAF was primarily concerned with replacing the jobs and revenue lost from the decline in tobacco production. Our core work was focused on helping communities replace jobs and preparing adults for the workplace. After the first few years of making grants, we began to look back and think through how we needed to start developing the pipeline by working with youth to develop a pool of qualified workers. We heard about a skills gap from employers but also an interest gap from parents and students. It was not unusual to hear a parent say, “Thou shalt not pursue employment in manufacturing! I lost my job when the factory closed. You can be a doctor, a lawyer, or any other profession, but don’t go into manufacturing!” And so, the interest gap was something that really caught our attention. We knew that if we were trying to influence students’ decisions in high school, we needed to start early and expose students to career options in the local and regional labor markets. 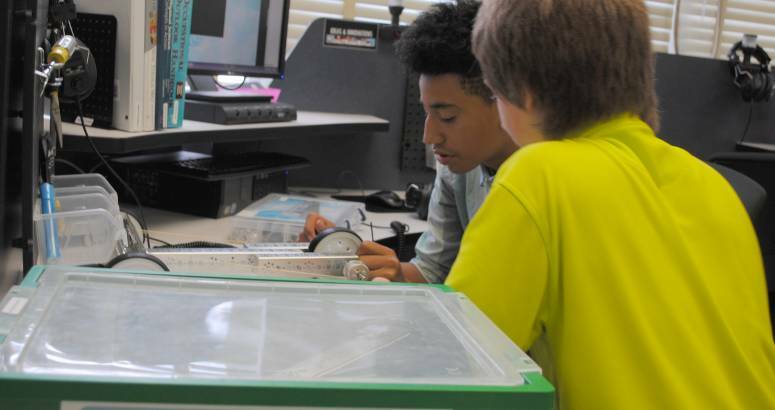 Through research conducted by graduate students at Duke University’s Sanford School of Public Policy and some internal findings, we decided to start exposing students to STEM skills and career exploration beginning as early as the fourth grade so they could be successful in the gateway course, Math I, and to extend support on up into the ninth grade to make sure that they were successful. So that drew our initial target on skill building and career exploration for students in Grades 4-9.
organization’s aims to seed new economic opportunities in struggling rural communities. “After graduating from high school, I was told that I needed to get out of the rural community where I grew up because there was nothing there for me. I went away to college but wound up back home operating the family business. I saw the brain drain that was happening in rural communities and knew that if there were not some real innovative ideas and dedicated resources to help stem the brain drain, many rural areas would cease to be viable places. The economic declines and dwindling populations would end up being the demise and downfall of rural life as I knew it.” Now with more than 18 years of work leading GLF’s education and workforce preparedness grant initiatives, Sorrells is seeing the positive impact of investments made to rejuvenate the rural landscape of NC, particularly in the NCEast Alliance region where GLF has pumped significant resources into establishing quality STEM programs in rural schools. Creation: In 1999, the North Carolina legislature created the nonprofit Golden LEAF Foundation to administer one-half of North Carolina’s share of the Master Settlement Agreement resulting from litigation with cigarette manufacturers. Focus: The Foundation’s mission is to assist rural, tobacco dependent, and economically affected communities with economic transition. Its grant making focuses on critical issues facing rural communities: advancing agriculture practices, creating opportunity for job creation, helping retain crucial businesses at risk for leaving an area, and readying the workforce. The Foundation also works with schools to prepare students for college and the workforce and other priorities that help move communities toward economic vitality. $624 million in new payroll. 68,000+ workers trained or retrained for good-paying jobs.